New VA partners – Do you have all your parts? You know when you go to assemble a project and they show you all the parts and tools you will need on the first couple of pages? If you are like me, you probably skip right to Step 1, but in our case, I want to ask that you to check a few things to make sure that you have everything setup the way it should be. 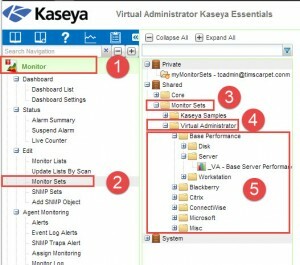 When you first get your “Welcome” email with your credentials (comes from Kaseya_Trial@kaseya.net), the Kaseya provisioning server is busy in the background generating all kinds of proprietary content for you to use. You need to allow at least an hour for this to complete. Sadly we have found that sometimes it gets stuck, or somehow isn’t able to complete a task, even after waiting. This is a quick check to make sure you have everything setup the way it should be. Please take a few minutes and do a visual check of each of these, and if you find something missing, please open a ticket with us so we can fix it for you. You should have 4 default templates. Review these by going to the Agent tab (#1), select Agent Status (under Machine Status) (#2), and on the right make sure you have all 4 templates showing. You should see 5 or more Deployment Packages, ignore the ones that begin with “myOrgDefault”. There should be one for Servers, Workstations, Laptops, Macs, and and Audit package. 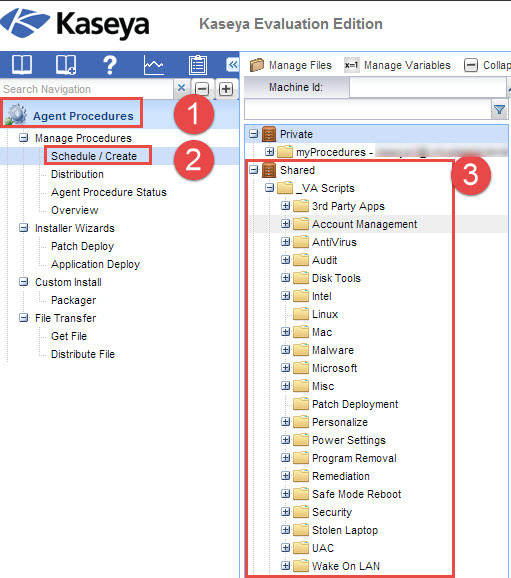 Access these from Agent Tab (#1), Install Agents->Deploy Agents (#2), and in the right pane, make sure you see the 5 default packages as shown below. Views are an important part of filtering out systems, and we have a number of default ones ready for you to use. Review these by going to Agent tab (#1), and near the top of the screen, click the drop-down arrow (#2), and make sure that you see some views in the box (#3). Agent Procedures (or Scripts as us ol’ timers still call it) is how you do much of the automation within Kaseya. We have a proprietary collection of hundreds of scripts and many of them should be loaded in for you. Sadly, this is an area that Kaseya often chokes on (probably because there are so many! ), so please check it and let us know. You can always download the scripts you need from our “ClubMSP” site. 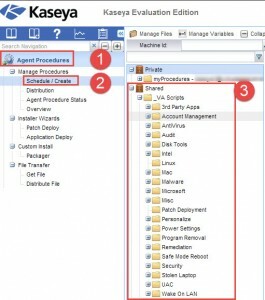 Access this by going to the “Agent Procedures” tab (#1), Manage Procedures-> Schedule/Create (#2). Give it a few moments to come up, click on Shared, and then click on “_VA Scripts” and see if you screen looks like the one below (#3). Monitor sets are used to monitor performance, services and applications on a machine. We have a set of default ones for you to use. 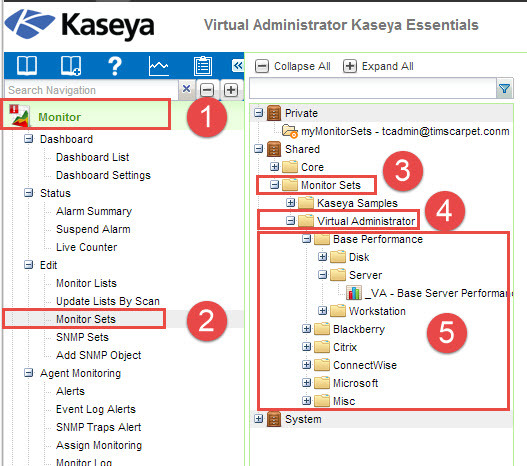 Access by going to Monitoring tab (#1), Edit-> Monitor Sets (#2). Give it a minute to come up, and in the right hand pane, under Shared, click the “+” next to Monitor Sets (#3), then Virtual Administrator (#4), and click some of the sub folders (#5) and make sure there is content there. Your’re done! Be sure to open a ticket with us if anything is missing. Thanks for checking!